This is a really cool map! 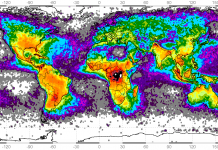 These maps show lightning strikes around the world in real time. Blitzortung aims at establishing a low budget lightning location network with a high number of stations. On the Blitzortung webpage, you can watch and track lightning storms in Europe, Oceania, North America, Asia, and South America in REAL TIME. 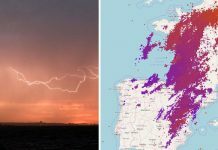 Thanks to the Blitzortung.org you can track IN REAL TIME the intensity, direction and density of thunder and lightning storms on high-resolution maps of Europe, Oceania, USA and Japan. To make it come through, a number of volunteers around the world have set up a $275 detection kit composed of an antenna system, amplifier, and controller (pretty cheapa dn easy to do! ), which records and detects and sends the lightning strike radio signal exact time and location to the Blitzortung servers. 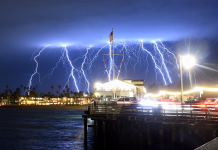 As low frequency RF waves can travel thousands of miles, a receiving station in New York, can still pick up lightning strikes in the Caribbean. 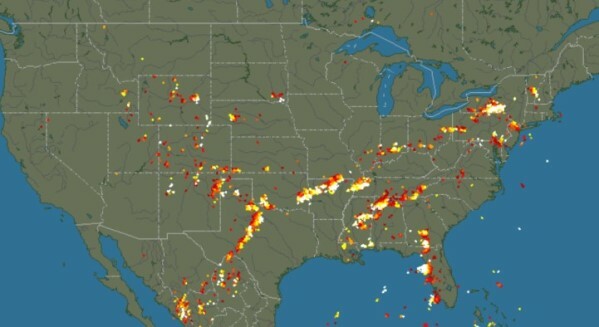 Look at the lightning map of your region.